At times, it can be helpful to use slide numbers in your presentations. 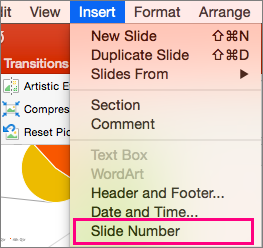 Here's how to add slide numbers in a presentation in PowerPoint 2016 for Mac. On the View tab, click Normal. Click the Insert menu, and then click Slide Number. The Header and Footer settings will open. Check the box next to Slide Number and enter the number you'd like to start your slide numbers with. The location of the slide number is highlighted in bold in the Preview area at the top of the settings box. (Optional) If you don't want to number your title slide, make sure the box next to Don't show on title slide is checked. When you're finished, if you want slide numbers on your entire presentation, click Apply to all. 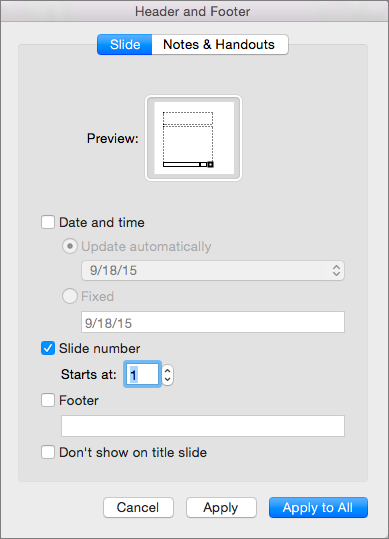 If you only want numbering on the slide or slides you have selected, click Apply.